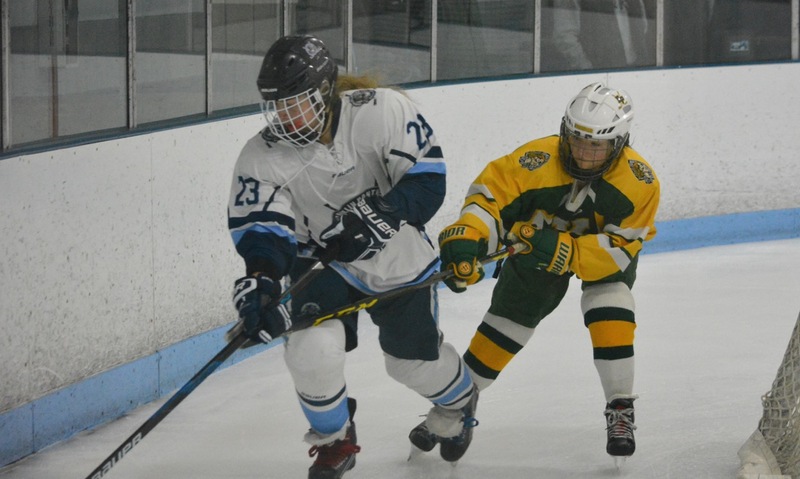 RANDOLPH, Mass – For the better part of Saturday’s contest between #14 King Philip and #3 Archbishop Williams, the Warriors were the better team on the ice. Unfortunately, King Philip found itself chasing the game, and despite a strong push to get even, the Warriors fell 3-2 to the Bishops at Zapustas Rink. “I would agree,” said KP head coach Jack Unger about being the better team over the final two periods. “We’ve had a rough time getting goals over the course of the season. But they keep fighting and that’s all you can ask for. Archies scores just under four minutes into the game to take an early lead, but King Philip balanced the play out by the end of 15 minutes, both teams putting six shots on net in the frame. King Philip even killed a penalty shortly after going down a goal. A nice stick lift from sophomore Sammy Robinson led to a chance in front for Ali Wilson but her bid was cleared away by the defense. Just a minute later, Meghan Gorman found some space and centered a pass to junior Alli Meehan but Archies goalie Allison Delmonte made a nice pad save to keep the chance out. The Bishops capitalized again on an early goal, this time just 21 seconds into the second period to take a 2-0 lead. But as the midway point of the second came, the Warriors found themselves with the majority of puck time and chances on goal. 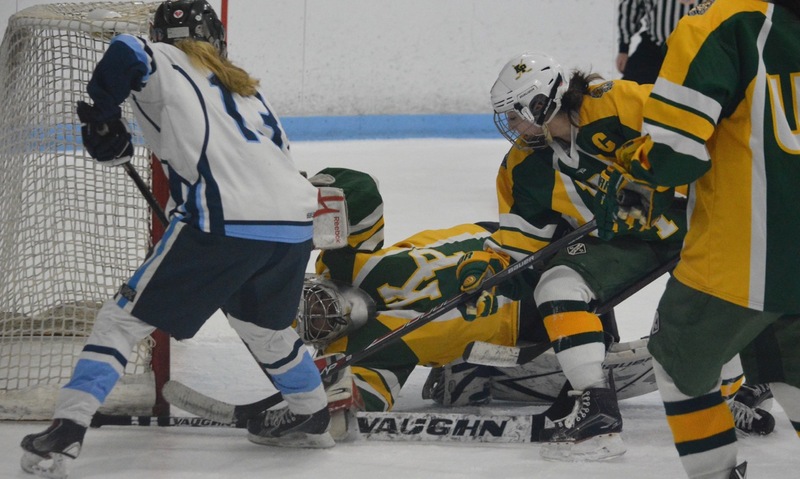 With just under nine minutes to play in the middle period, King Philip registered its first good chance when Katie Crowther connected with Gorman just across the blue line, and Gorman slid a pass towards goal but the defense came away with a clearance before Meehan could get a clean look. King Philip’s Kyleigh Remmes made a nice hustle play to partially block a clearance from the Bishops and was rewarded with possession in the attacking zone. She tossed her shot towards goal that created a scrum in front of Delmonte but the puck was swept away by the Bishops’ defense. The Warriors continued the pressure with just over two minutes to go when freshman Avari Maxwell skated in but her shot went just high. KP kept the puck in the offensive zone and it eventually popped out to the blue line. Junior Nicole Connor used a nice move to fake around the first defenseman and then sniped her shot top shelf to make it 2-1 with 2:04 left in the second. After giving up early goals in each the first and second periods, the Warriors came out with purpose in the third and applied the pressure to the home side. The pressure resulted in a power play for KP when Archies was whistled for hooking with 12:43 to go. KP had the puck in the attacking zone for nearly a minute but couldn’t get anything through to the goal. After a clearance, the Warriors attempted to skate back up ice but Archies’ Marguerite Leonard intercepted a cross ice pass, skated in alone and deposited a shorthanded goal to make it 3-1 with 11:21 to play. Despite falling behind two goals to the third-seeded Bishops, King Philip continued to battle. Junior goalie Lilly Potts then came up with her two biggest saves of the game to keep the Warriors alive. First, Leonard jumped on a loose puck and skated in alone on goal but Potts stayed with her and pushed the bid aside. Seconds later, Bishops junior Mackenzie Heath had a partial breakaway chance but once again Potts away up to the task and made the save. Those saves allowed the Warriors to come down the other way and capitalize. Connor came flying into the zone along the right side, getting around her defenseman before firing a high shot. The chance forced a save from Delmonte but the rebound fell right in front and Meehan alertly batted the loose puck in to make it 3-2. KP continued to play on the front foot and had a couple of chances over the final two minutes, but couldn’t convert any before the final buzzer sounded. King Philip girls hockey finishes the season 11-9-2. King Philip, 58 @ Attleboro, 64 – Final – Click here for a Photo Gallery from this game. Canton, 53 @ North Attleboro, 35 – Final – Click here for a recap of this game. Franklin, 63 @ Oliver Ames, 50 – Final – Click here for a recap of this game. Stoughton, 53 @ Milford, 68 – Final – Milford seniors Kayden Kelley and Andrew Fraioli both recorded double-doubles to help the Scarlet Hawks take down the Black Knights. Kelley had a team-high 14 points along with 10 rebounds while Fraioli had 11 points and 11 rebounds. Juniors Brendan White added 10 points and junior Brendon Sailer netted a career-high 10 points in his first career start. King Philip, 41 @ Attleboro, 52 – Final – Click here for a recap and photo gallery from this game. Canton, 64 @ North Attleboro, 57 – Final – Canton’s Hannah Jerrier had a monster night, scoring 30 points while hauling in 15 rebounds and dishing out four assists. Stoughton, 32 @ Milford, 37 – Final – Kate Irwin was the top scorer for the Hawks with 19 points, while Jess Tomaso chipped in with seven and Emily Piergustavo had six. King Philip, 2 @ Mansfield/Oliver Ames, 1 – Final – King Philip’s Avari Maxwell shorthanded goal at 11:22 of the third period – which turned out to be the game-winner – helping the Warriors secure two points in a key league game. MOA took the lead in the first off a goal from Mackenzi Fraser (assisted by Isabelle Shanteler and Cat Luciano) but the Warriors tied the game with just 26 seconds left in the period on a goal from Nicole Connor. KP head coach Jake Unger credited the defensive play of Jessica Daniels and Katie Crowther, as well as the strong play of goalie Lilly Potts. CANTON, Mass. – One of the main reasons for Canton’s run to last year’s Div. 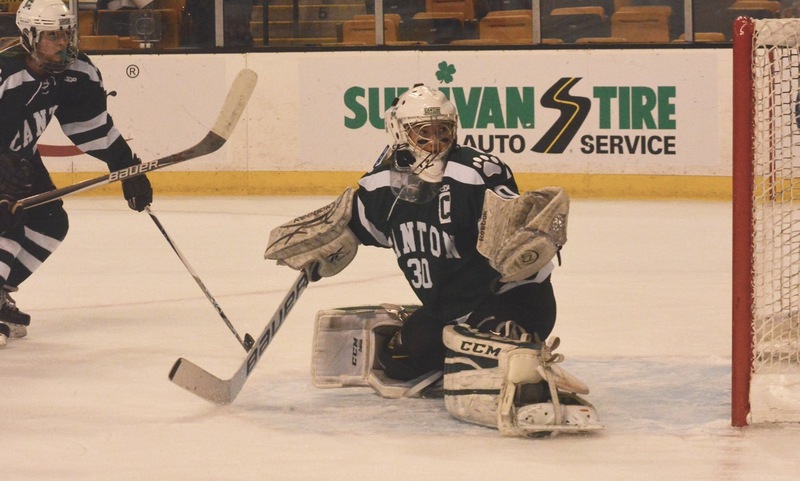 2 state title game at the TD Garden was a stingy defense and the play of goalie Colleen Kelleher. 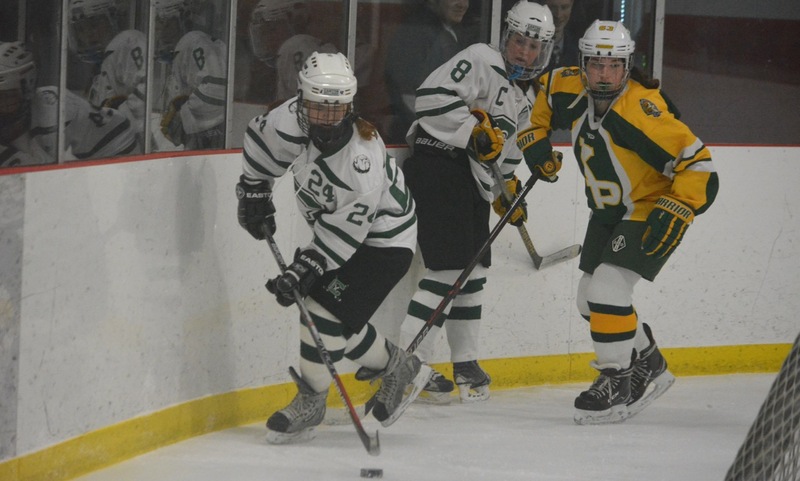 That formula seems to be working again this winter and was on full display against King Philip on Wednesday afternoon in the Bulldogs’ first game at the Canton Ice House and their debut in the newly formed Hockomock League for girls’ hockey. Behind a second period goal from freshman Lizzie Tassinari and 15 saves from Kelleher, Canton earned a 1-0 shutout and started its new league campaign with a hard-fought two points. Canton nearly jumped out to the perfect start when Lauren Fitzpatrick raced down the right wing a minute into the game and forced a kick save out of KP goalie Lilly Potts, one of 19 stops for the junior. The first period was fast-paced and end-to-end, but both defenses were tipping and blocking a number of shots, limiting the teams to a combined eight shots on goal. KP had two of the best chances with Meghan Gorman forcing a save out of Kelleher from the right circle and, with just 10 seconds left on the clock, Nicole Connor had a close-range backhand blocked aside. Fitzpatrick had the first chance of the second period as well, but just 20 seconds later it appeared as though KP may have taken the lead. Kyleigh Remmes had her first shot saved but followed the rebound and beat Kelleher with a backhand that the junior thought had found the back of the net. As Remmes put her hands up to celebrate, the officials held their whistles and play continued. Gorman had a shot from the point knocked down by Kelleher, who then shuffled over to stop Remmes on the rebound. Leah McClellan had a shot for Canton from the blue line but Potts stayed down on the bounce to save it. With only 31 seconds left in the period, Canton broke the deadlock. McClellan picked up the puck in defense and sped forward into the attacking zone. She crossed the puck from the left boards to Maggie Malloy in the slot, but it was deflected into the crease. After a scramble in front, Tassinari managed to squeeze the puck through the crowd and past Potts. Not only was it important for the Bulldogs to jump into the lead but the timing of the goal provided a shift in momentum heading into the third. Canton started the third on fire, recording the first five shots of the period and forcing Potts to come through with several difficult saves to keep the Warriors just a goal down. Ellie Rae Roberts had the first chance with a backhander from the edge of the crease and Katie Holleran followed with a chance from the slot, but Potts saved both. With nine minutes to play, Potts again made the save to stop a Fitzpatrick breakaway and then denied McClellan on another long rush. In the final five minutes, KP flipped the momentum and started to press in search of a tying goal. In one sequence Gorman found Olivia McCarthy who then fed it on to Remmes for a great chance from the slot but Kelleher got a piece and the rebound trickled wide of the post. Thirty seconds later, Kelleher made an even better stop to deny Gorman when a shot from the point angled to the back post and off the forward’s skate at the back post. Somehow, Kelleher (15 saves) managed to quickly get her left pad out to deny the unexpected shot. “The ice was tilted and it would’ve been nice to sneak one in there and it would’ve been exciting, but they worked hard and it just didn’t get through,” said Unger. Canton (2-0-1, 1-0-0) will get a week off before hosting Westwood at the Ice House. 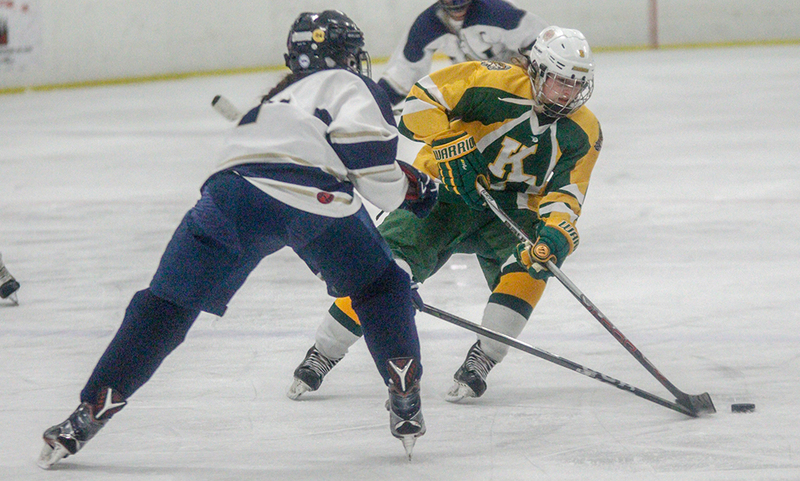 King Philip (1-2-0, 1-1-0) will look to bounce back on Saturday when it travels to face Dennis-Yarmouth at the Tony Kent Ice Arena. Attleboro struggled in its closing games of 2016-17 and narrowly missed out on a place in the state tournament via the Sullivan rule. This year’s Bombardiers are hoping that a mix of youth and experience will be enough to get the team over the hump and back in the playoff mix. The main scoring threat for Attleboro this season is senior forward Jake Parker, a HockomockSports.com Second Team selection last winter who led the team with 20 goals despite facing regular double teams and playing loads of minutes. Parker will be joined up front by sophomore Ryan Morry, who is coming off a solid rookie campaign and will try to take advantage of the opportunities Parker creates near the net. Attleboro’s experience is on the defensive side of the ice. Seniors Eddie Noel and Sam MacKenzie and junior Kyle McCabe provide size, physicality, and reading of the game to protect the Bombardiers goal. Attleboro coach Mark Homer, in his second season with the team, is expecting the defensemen to be aggressive in the zone and be more prepared to clear the puck. The Bombardiers are also experienced in goal with junior Evan Andrews and sophomore Derrik Rivet offering a solid one-two between the pipes. 2016-2017 Finish: Reached Div. 2 South Semifinal. After another league title in 2016-17 and a run to the Div. 2 South semifinal, Canton has started this season with a win and a draw (that turned into an overtime win in the final of the Gormley Cup) and the expectations remain as high as ever for one of the teams to beat in D2. Last season, Canton was by far the league’s best defensive team, allowing only 32 goals in 24 games. The next best defense allowed 48 goals. But, the Bulldogs will need to rebuild the blue line this season after the graduation of HockomockSports.com Player of the Year Jackson Maffeo and Third Team selection C.J. Martin. Defensemen Brad Murphy and Nick Allen have experience and will be counted on to step up to bigger roles this year. The key for the Canton defense, which has allowed only one goal in two games so far this season, will be junior goalie Quinn Gibbs. He was a HockomockSports.com First Team choice last year with a league-best 0.924 save percentage and there is hope he can get even better with a year of experience. Offensively, the Bulldogs bring back most of the goals from last year with Ryan Nolte, Johnny Hagan, Bubba McNeice, and Jack Goyetch all returning this season and all having scored big goals in big moments for Canton during last season’s tournament run. 2016-2017 Finish: Reached Div. 3 First Round. Foxboro saw improvement last year, increasing its win total, goals for, and allowed fewer goals than the season before. Head coach Mark Cedarchuk is hoping that trend continues this season as the Warriors look to try and compete for the spot in the postseason. The Warriors will be relying on a mix of experience as well as youth to try and compete in the Hockomock League this year. Senior captain Aidan Sullivan (two goals, six assists) has been an anchor of the team’s blue line unit over the past couple of seasons and will be relied upon to lead the way again this year. Senior captain Taylor Sharfman is another defenseman that gives the Warriors two capable and reliable options in the back. Junior Tanner Kennedy is also back after a solid sophomore year and Warriors added junior Brendan Tully to the defensive unit. On offense, Foxboro graduated its top three goal scorers but sophomore Ronnie MacLellan (four goals, seven assists) is back after a strong sophomore year. He will be joined up front by senior Sam Garrabrant and sophomore Sebastian Ricketts, who had four goals and two assists last year. Foxboro will have to find a replacement for goalie John Cronin, a multi-year starter in between the pipes for the Warriors. Foxboro has three goalies – freshman Jack Spinney, sophomore Espen Reager, and freshman Connor Callahan – listed on the roster. “With a combination of experienced upperclassman and talented underclassman, we’re looking forward to an exciting and competitive season,” Cedarchuk said. 2016-2017 Finish: Reached Div. 1 South Quarterfinal. Although last winter was atypical for the Panthers, losing two games in the league for the first time in several years, Franklin won another league title and with 20 players back for this season the expectation is that a seventh straight league crown is a distinct possibility – not to mention making a run in the state tournament. Experience will be the key for the Panthers. Most of the forwards were members of the team that won the state championship two years ago and know what it takes to get goals against top competition. Leading scorer Brendan O’Rielly is back after scoring 20 goals and recording 11 assists last season. He should have plenty of help up front with classmates Luke Downie, Jeremy Miller, T.J. Durkin, and Ken Demerchant, who are all three-year varsity players for the Panthers. Defensively, Franklin has lost several talented young defensemen to other programs in recent seasons, but still boasts a strong defensive corps heading into this winter. Jack McGrath, Matt Crane, Connor Norton, Cam Cassella, and sophomore Tom Tasker will all contribute to the defensive pairings this season and that depth will be important over a long season. The goalie position is a battle between three seniors, including returning netminders Owen Ginley and Dan Sheehan, who both saw time last year. King Philip finished just below .500 in the league last season, and just five points out of second place in the Kelley-Rex division, but struggled in the non-league schedule, losing all 11 games outside of the Hock. The Warriors will look to improve that considerably this year with an experienced roster that wants to challenge for a league title. KP returns 13 players from last year’s squad and that experience will be vital to allow the Warriors to compete not only in the league but against a schedule that has been bolstered because of the program’s move up to Div. 1 several seasons ago. Offensively, the attention will be on senior forward Collin Cooke, who chipped in with 10 goals and seven assists and has been drawing the focus of opposing defenses for several years. Senior Gavin Maxwell had nine goals and eight assists last season and will again be a solid counterpoint to take some of the pressure off Cooke in the attacking zone. On the defensive side of the ice, KP continues to be a physical team that likes to be aggressive attacking the puck. Senior defensemen Will Connor will get some help at the back with the return of senior Mike Curtin from juniors, who head coach Paul Carlow said could be an “anchor” on defense. Senior Shane Frommer, fresh off a stellar football season and another Super Bowl title, will quickly transition from the gridiron to be the team’s starting goalie, after posting a 2.66 goals against average in 2016-17. 2016-2017 Finish: Reached Div. 1 South First Round. In last year’s state tournament, Mansfield held its own against perennial power Xaverian before losing 2-1 in the opening round and that defeat is spurring the Hornets on this season, as the team has built a deep roster that believes it can challenge for the Kelley-Rex crown. Team speed is going to be a strength for the Hornets this season, even without several key pieces from last winter, including breakout freshman Chris Jenkins, lost to graduation or to juniors. Senior forward Dylan Tivnan and Cullin Anastasia will be back to man the top scoring line along with freshman Coleman Jenkins. The second line will feature a lot of youth with sophomore Jake Lund and freshman Matt Copponi alongside junior Chris Copponi. Seniors Tyler Oakley and Tim Arnold will be the leaders on the defensive side this year, while senior Ryan O’Hara and juniors Nick Levine and Austin Ricker will give the Hornets depth in the defensive unit. That depth should make things easier for sophomore Sean McCafferty, who will be stepping between the pipes for Mansfield this season. North Attleboro is coming off its most successful season in program history, and will be starting a new chapter with new head coach Ben McManama. The Rocketeers will be tasked with finding replacements for some of the top players in the league from a season ago. Someone will need to step up in order to fill the void left by Zach McGowan (19 goals, 13 assists for 32 points – third most in the Hockomock) as well as Hunter Sarro’s 22 points and Erik Clements’ 20 points. Senior Jason McNeany is a key piece back for the Rocketeers, fresh off a terrific football season. He scored 13 goals last season and added 13 assists, and has been a big piece of the offense for many years now. He will be counted on to be a leader this season, both in the locker room and on the ice. Under first-year head coach Sean Bertoni, Oliver Ames proved to be a strong skating team that could cause a number of problems with its dangerous attack. That speed up front will be put to the test again this year, as the Tigers look to jump from second in the Kelley-Rex division to the top of the standings. The Tigers have a number of talented forwards returning from last season’s team, which reached the Div. 2 South tournament and beat Nauset only to run into state finalist Scituate in the second round. That loss will provide motivation for junior forward Brett Williams, who was on the HockomockSports.com Second Team with 12 goals and eight assists last year, and the rest of the OA forwards. Williams will be joined up front by seniors Eric LeBlanc and Rory Madden and junior Max Ward. On defense, junior Matt McCormick returns to be one of the top four along with senior Mike Nikiciuk. Both players will provide leadership for a defensive unit that promises to be aggressive in both zones, as Bertoni continues to implement his system at OA. Sophomore goalie Owen Connor will be the new goalie for the Tigers. Numbers are a bit down for the Stoughton High hockey team this season, so the Knights will be relying on their most experienced players to lead the way, especially early on. On offense, the Knights boast senior Brendan Campbell at center and junior Sean Doherty at wing. Campbell had a team-high in points last season, finishing second with 11 goals while recording a team-best 15 assists for 26 points. Doherty was third on the team, tying for the team lead with 12 goals and finishing with 25 points. Senior Cam Nelson and junior Josh Hough will be the leaders of the Knights’ defensive unit. Hough is a captain along with Campbell and Doherty and has the most experience on the blue line. Nelson also saw plenty of time last season, recording an assist. “We are an inexperienced team that will improve as the season goes on,” said Stoughton head coach Dan Mark. Taunton has grown by leaps and bounds over the past couple of seasons, setting new program bests for wins and making the state tournament two seasons in a row. This year’s team features only three seniors, so the Tigers will be hoping recent success will continue with a youthful lineup. Senior forward Will Walsh has returned from junior hockey and will provide a boost to the front line, which head coach Kris Metea has high hopes for this season. Senior Jake Roberts is also back for the Tigers after scoring 18 points last year and junior Cam Sneyd is back after a 16-point season last winter. Metea is counting on high energy from the offensive unit and believes that the roster is capable of creating loads of scoring opportunities. Sophomore Sean Bunker will be in net for the Tigers and the defensive unit is fairly inexperienced, although the coach believes that by working together Taunton will be able to put together a solid back line. The hope is that defense will become a strength of the Tigers by the end of the season. Canton is coming off a remarkable state tournament run that took the No. 14 seed all the way to the TD Garden and the program’s first state title game appearance since 2006. After years of competing in the SEMGHL Coastal division, the Bulldogs are excited for the first Hockomock League girls’ hockey season and enter the new season as favorites to bring home the first Hock title. A number of key players are back from the team that battled Notre Dame Academy (Hingham) in the state championship game last March and will be counted on to put together another solid defensive effort that made the Bulldogs so tough to play against during the tournament run. Spearheading that defensive unit is senior goalie Colleen Kelleher, who was stellar throughout the state tournament with clutch saves in key situations. On offense, Canton returns plenty of firepower. Juniors Maggie Malloy and Lauren Fitzpatrick emerged as big time scorers last year and came through with important goals to help the Bulldogs make a run to the Garden. Senior forwards Melissa Devane, Kendra Farrelly, and Andrea McNeil give Canton a loaded attacking unit that always seemed to pop up with goals when the team needed it most. Franklin enters the first Hockomock League girls’ hockey season with a young roster, but one that is expected to compete with the other four teams and have a shot at bringing home the inaugural title. Junior Regan Paterson and senior Jackie Connelly will be expected to provide leadership and create scoring opportunities for a roster that is loaded with underclassmen. Both players provide speed and playmaking ability in the attacking zone and the Panthers will be counting on their experience to make the difference. Leadership is going to be critical for this year’s team and head coach Marjorie Burke is looking to her senior class to provide direction for the youthful lineup on both ends of the ice. Among the seniors that Burke is looking to this season are Bella Trask, Caroline Hedvig, Maddie Hinkley, Jillian McGlaughlin, and Connelly. 2016-2017 Finish: Reached Div. 2 First Round. Three years ago, King Philip was the top seed in Div. 2 and after two more playoff appearance, the Warriors now have the opportunity to bring their recent success into the first ever Hockomock League girls’ hockey season and hope that an experienced lineup could make them the first Hock champs. 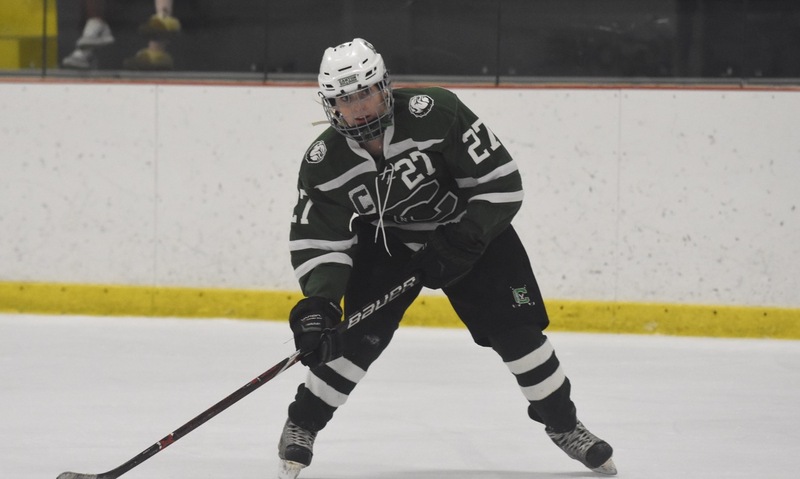 Junior Nicole Connor is off to a strong start this season and has the potential, according to KP coach Jack Unger, to be one of the top players in the Hockomock League this year. Connor will play both at forward and along the blue line, crucial versatility that makes her an important piece for KP. The Warriors return five seniors who will be the “backbone” of the squad, said Unger. Kyleigh Remmes, Olivia McCarthy, Jessica Daniels, Katie Crowther, and Talia Quinn give the Warriors depth all over the ice. Lilly Potts returns for her third year in between the pipes, while sophomore Cristina Coleman will be the backup netminder. Freshmen Avari Maxwell and Jordyn Remmes will be instant contributors on offense, while classmate Marin Cormier will step in on defense. Sophomores Abby Carr and Sammy Robison are also expected to step in at forward this season. “[The roster is] rounded out by a number of talented juniors who should be able to spread out the scoring amongst the three starting forward lines,” said Unger. Mansfield, Oliver Ames, and Foxboro have joined forces since the 2014-15 season and have reached the postseason each of the past two winters, suffering an overtime loss to Walpole in the first round of the state tournament last year, and have started this season with an impressive win in the opener. The Warriors will be led by Foxboro’s Catherine Luciano. The senior was the team’s leading scorer last year and scored a hat trick in the season opener to get off to another strong start. Joining Luciano on the top line will be Mackenzie Fraser and Isabelle Shanteller. Other contributors in the offensive zone include senior Kayla Dalton, Kristina O’Connell, and Lindsey Corning. While the Warriors are expected to create a number of scoring opportunities, defense will be just as important if Mansfield/OA (MOA) is going to make it a third straight playoff appearance. Denea Reager, Ali Delano, and Emily Bubencick will all be critical components of the Warriors defensive unit. Senior Kerren Holmes will be back in goal this year to stifle the opposition, while freshman Cate Gallegher will be the backup netminder. The newest of the programs in the inaugural season of Hockomock League girls’ hockey, Stoughton is in only its third season of varsity play, but the Black Knights are counting on last year’s experience and the growth in the program to make them a team to watch out for this winter. Two-time all-star Julia Russell will be one of the key defenders for the Black Knights, but also brings an offensive punch with her speed forcing opponents to worry about her carrying the puck through the neutral zone. Senior Sarah Widrow will join Russell at the blue line and provides consistency in the defensive zone. Both will be expected to provide leadership for the less experienced players on the roster and try to make Stoughton a team that is tough to play against. The offense will be sparked by a pair of freshmen. Hailey Nelson and Morgan Lesso made an instant impact on their debuts, helping Stoughton start the season with a 6-5 win at Framingham in the season opener. Lesso recorded a hat trick against the Flyers to set a high standard in her first varsity action. Mansfield, 2 @ Coyle & Cassidy, 1 – Final – Click here for a recap from the game. 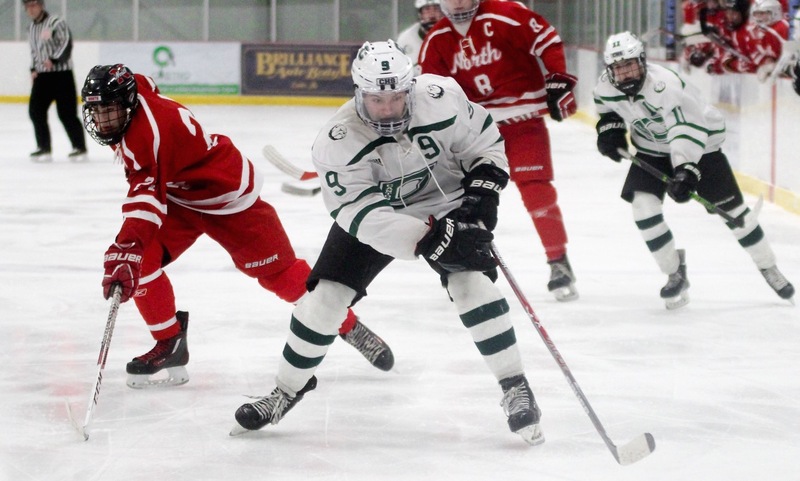 Taunton, 8 @ Dennis-Yarmouth, 3 – Final – Taunton raced out to a 6-0 lead through two periods and added two more in the third period for its third win of the season. Zack Albert had a pair of goals and an assist while Jack Patneaude (goal, assist), Mike Volkmann (two assists) and Andrew Carter (two assists) each had two points. Justin Chappell got the win in net with 14 saves. “We got contributions from all four lines,” Taunton head coach Kris Metea said. Mansfield, 37 @ Canton, 34 – Final – Click here for a recap from the match. Taunton, 12 @ North Attleboro, 36 – Final – Josh Grasso (126), Nuno Camara (182) and Woudanly Danger (220) had wins for the Tigers. Stoughton, 27 @ Oliver Ames, 52 – Final – Click here for a recap from the match. Canton, 88 @ Oliver Ames, 82 – Final – Three individuals qualified for sectionals for Oliver Ames and one relay team qualified for states. Alex Buche qualified for the 200 IM and the 100 free, Kyle Gray qualified for the 50 free and the 100 free and Nicholas Lombardo qualified for the 100 backstroke. The Tigers’ 400 free relay qualified for states with an impressive showing. Eli Vidoni and Cam Bourne had strong days diving for the Tigers. Sharon, 66 @ Franklin, 87 – Final – Roy Wang and Jack Cashin each won a pair of events to pace the Panthers. Wang won the 500 (5:22.31) and the 100 breaststroke (1:08.50). Cashin took the 200 IM (2:15.06) and the 100 backstroke (1:03.32). Canton, 94 @ Oliver Ames, 76 – Final – Oliver Ames’ Morgan O’Hara qualified for sectionals in the 100 free. Caitlin Campbell had a strong diving performance for the Tigers. Sharon, 67 @ Franklin, 101 – Final – Franklin finished first in every single relay event on its way to a big win over visiting Sharon. Freshman Katie McGuire was a double winner, taking first in both the 200 and 500 freestyle events. Senior Megan Lazarek was also a double winner, finishing first in the 200 IM and the 100 breaststroke. Oliver Ames, 125.55 @ Sharon, 122.7 – Final – OA freshman Lauren Picanzi won the all around with a 34.35 while junior Charis MacCuish finished second with a 33.9. King Philip, 1 vs. Ursuline Academy, 1 –Final – King Philip goalie Lilly Potts made a handful of key saves to help the Warriors earn a point. Jess Daniels scored from the blue line in the first period to put KP ahead but Ursuline tied the game in the second. KP and Ursuline will meet against in early January.